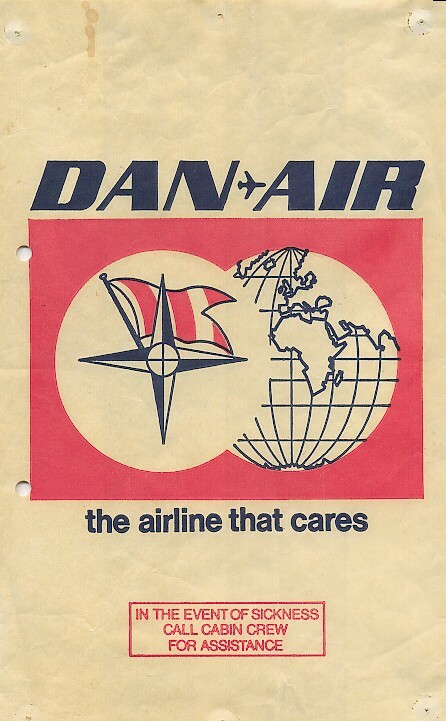 Fans of "You Don't Know Jack" will recognize that question 4 (the question that cares) blatantly ripped off Dan Air (the airline that cares) about 25 years later. But I caught it. 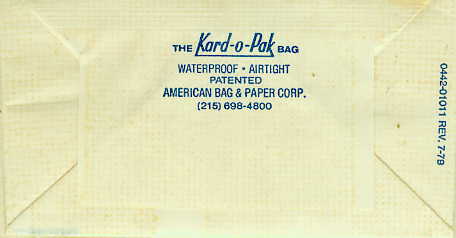 This bag is an oldie, back from an era where bag designs were bold and innovative. This one shows a navigational compass and the Earth with Europe and Africa prominent in the foreground. 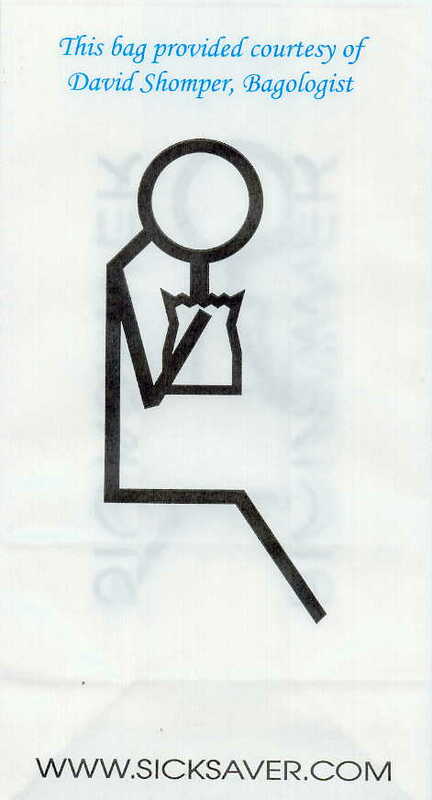 Either the bag designers were totally uncreative, or I'm uncreative in describing the bag in a compelling manner. Has combination airplane, compass, flag logo. 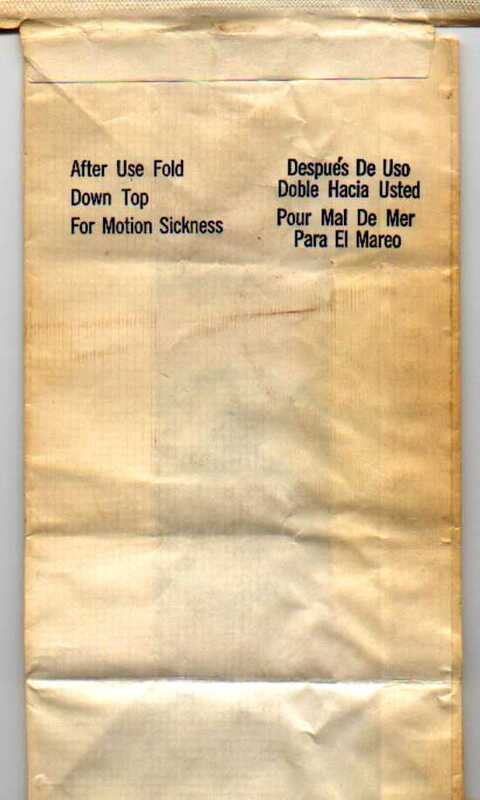 Same as it ever was, except directions are printed much lower on the bag. Very similar to the other Dan Air offerings except this bag is much wider. I'm pretty sure this is a generic Sic-Sac because it says Sic-Sac right on it, but perhaps someone knows more about this bag as I've never seen another like it. 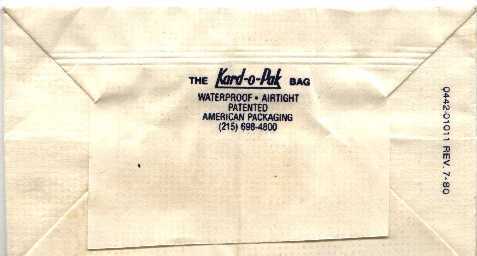 Walter Brinker positively identifies this bag as rare DANA, Dornier Aviation Nigeria AIEP, although he doesn't know what AIEP means. Bruce Kelly agrees and says that the airline is no longer in operation. 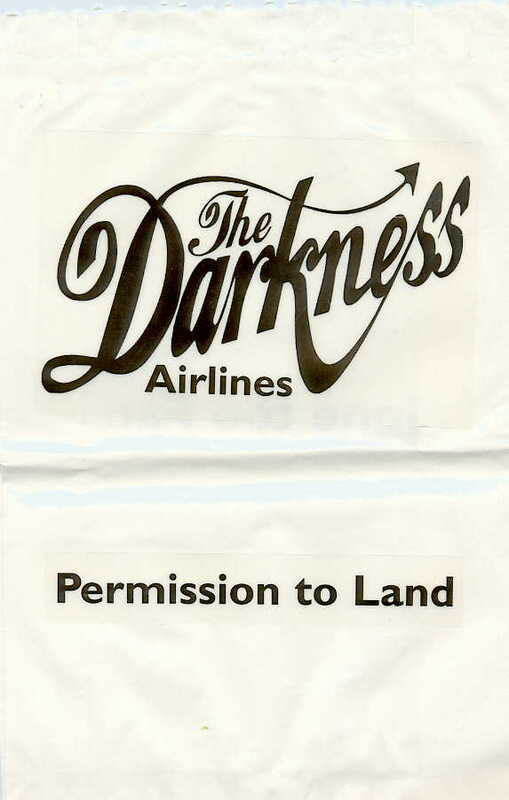 This bag, although it's really just 3 stickers on a bag, is a promotional item given to those attending the London launch party for the Darkness's Permission to Land album in 2003. This bag cost me about $20, ridiculously enough. 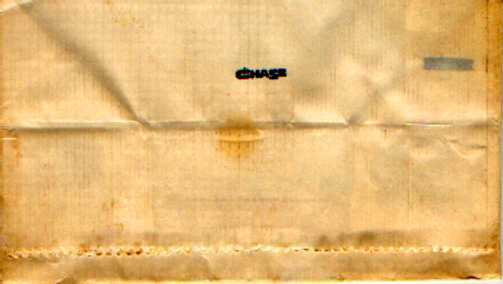 Colorado bagologist David Shomper proves that barf bag collecting can be intergenerational. 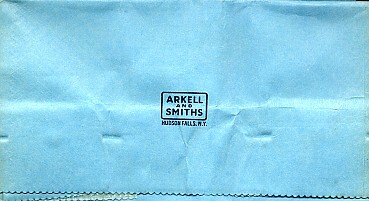 As a gift, David's son had a run of these personalized bags printed especially for him. We could all learn a little about raising a child from David. 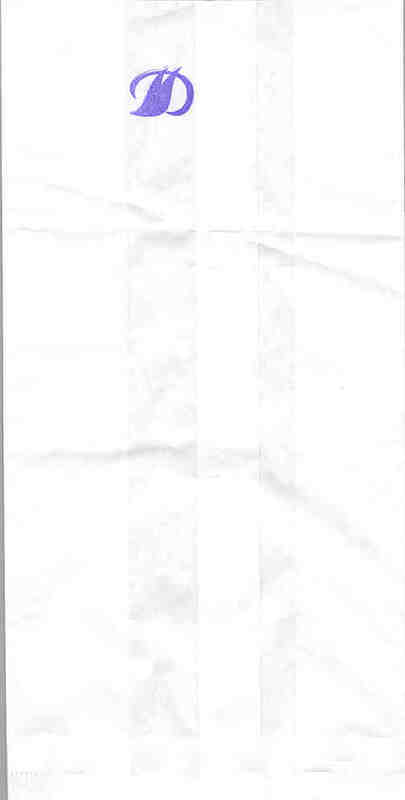 According to Bruce: Debonair-a French airline-this one is a plain white bag with a rather crude stamped, purple emblem at the top. 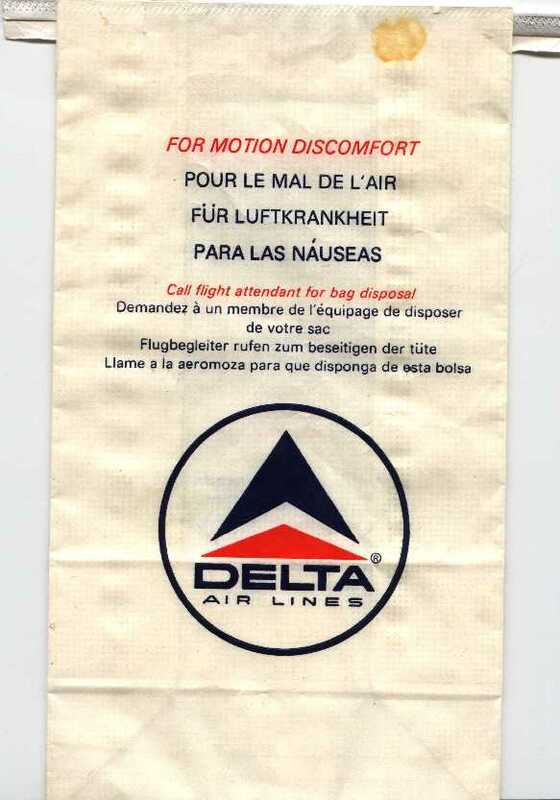 A friend states this is the standard issue barf bag for that airline and not a "doctored" bag. Talk about cheesy! Flash! 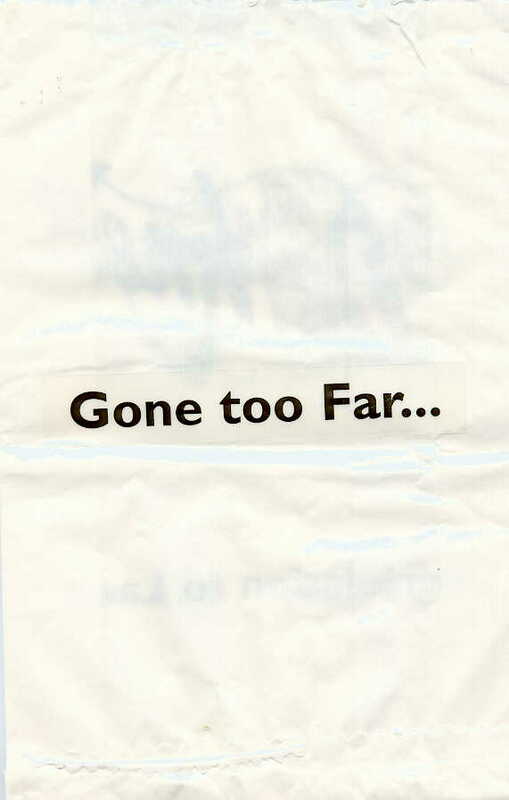 Bag afficionado Stewart Bryant claims that Debonair was a low cost UK airline that went out of business in the late 90's. I love the people you meet on the Internet. This bag screams 60s. There's a 12 question aviation "quiz". 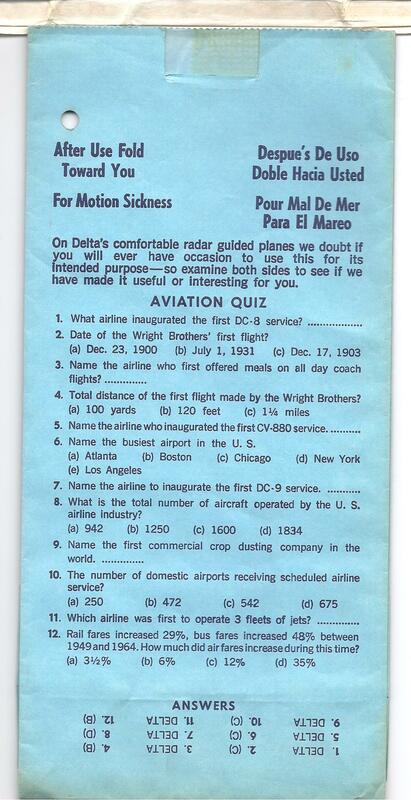 Six of the answers are Delta (no other airline is ever mentioned). 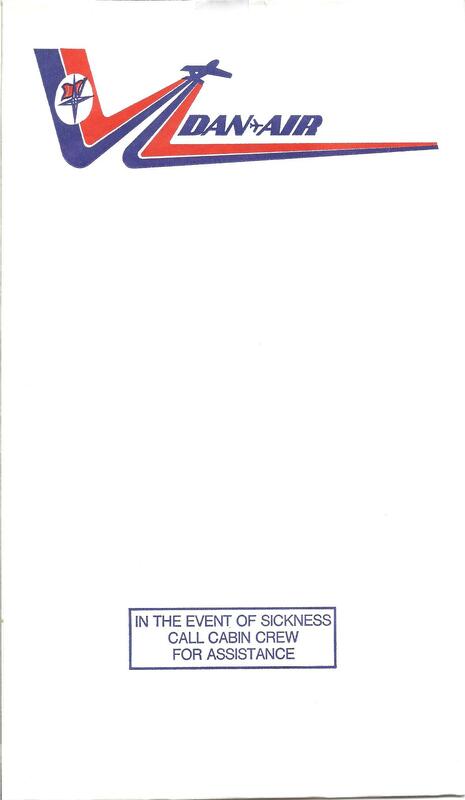 Was American society so pathetically naive self-aggrandizement as to not see through this? I guess what do you expect from a society that prides itself on and identifies with the brands displayed on clothing. 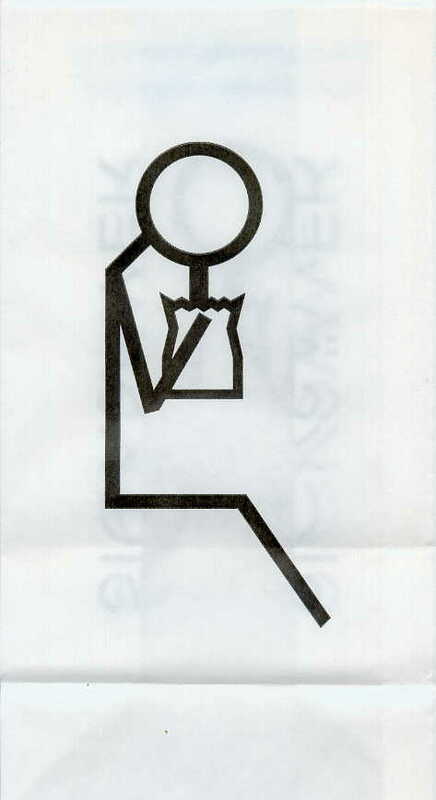 One thing I like about this bag is the section that says, "Anyone care to doodle". 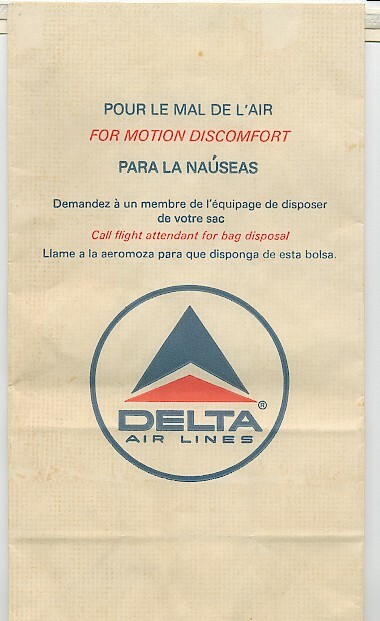 You know that this bag is old because it refers to a "stewardess". 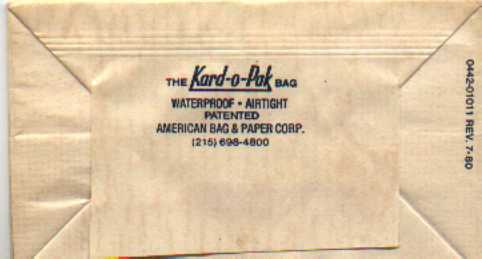 Like the other minimalist big logo bag, but the bottom of this bag says Chase instead of Kard-O-Pak. Comes with a thumb tab. 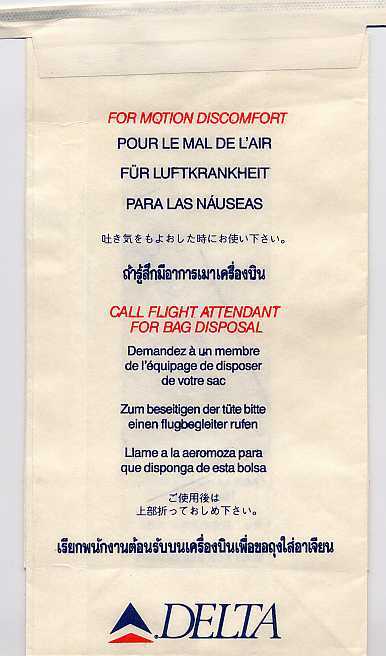 You know that this bag is old because it refers to a "stewardess". 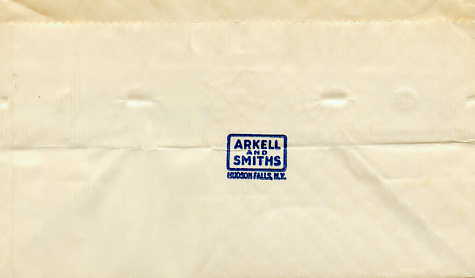 Like the other minimalist big logo bag, but the bottom of this bag says Arkell and Smiths instead of Chase or Kard-O-Pak. Comes with a thumb tab. 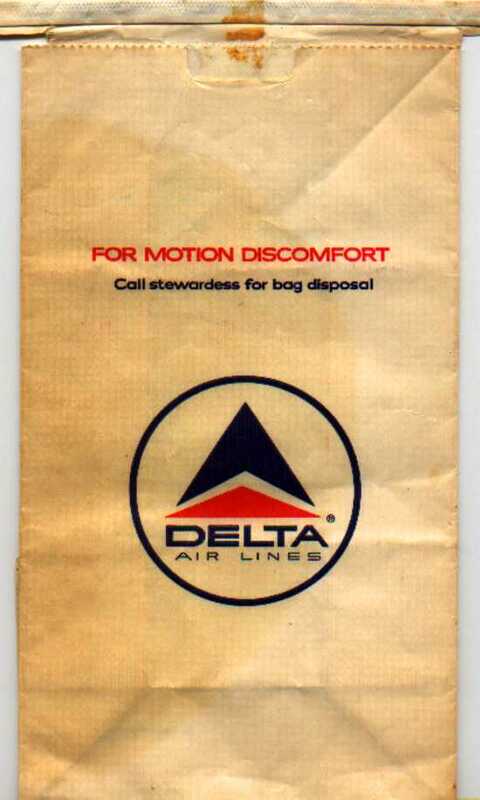 You know that this bag is old because it refers to a "stewardess". 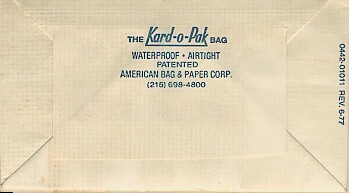 Like the other minimalist big logo bag, but the bottom of this bag says Kard-O-Pak instead of Chase. No thumb tab on this bag! And by the way, the bag is textured, quite a nice touch. 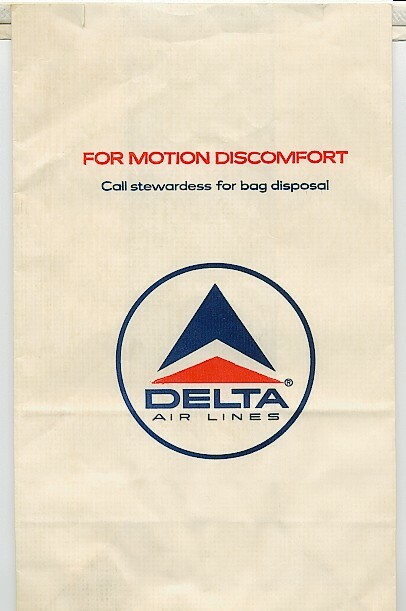 This bag is Delta's first foray into international bag design. 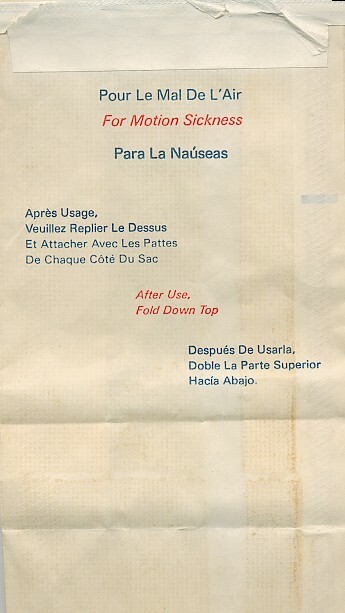 Features French and Spanish as well as English. 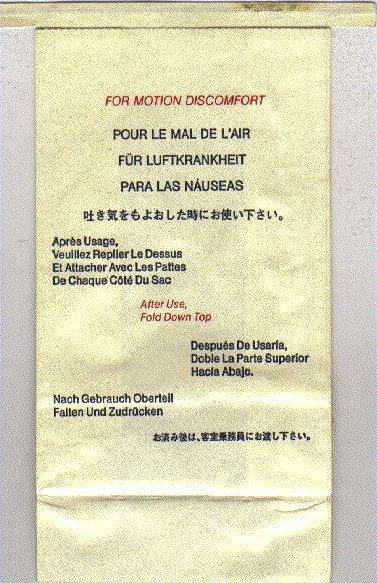 The interesting thing is that French is printed first. Very unusual but cool. 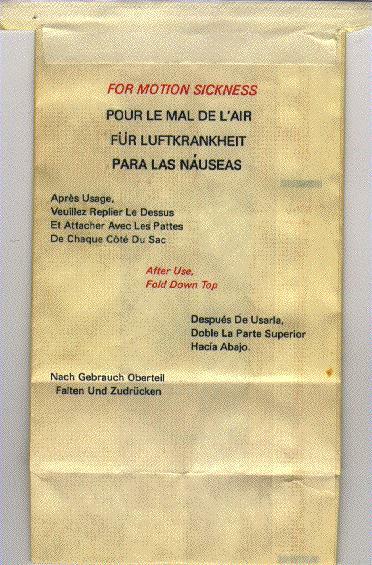 Only the bottom of this bag differs from the 1982 version with the polite German (which is really a 1980 version that was still in use in 1982). The bottom actually says "7-79", so it was dated for your identification convenience. 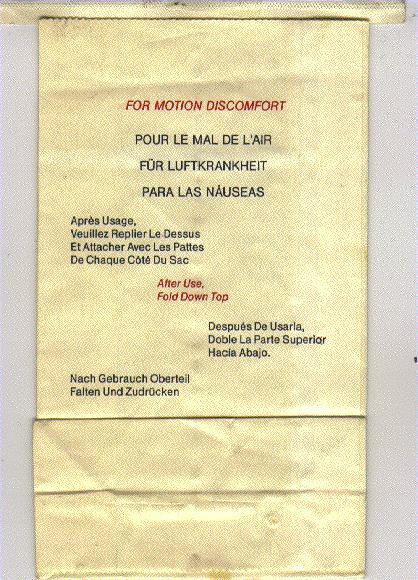 Apparently, some Germans felt that the bag's instructions weren't courteous enough. 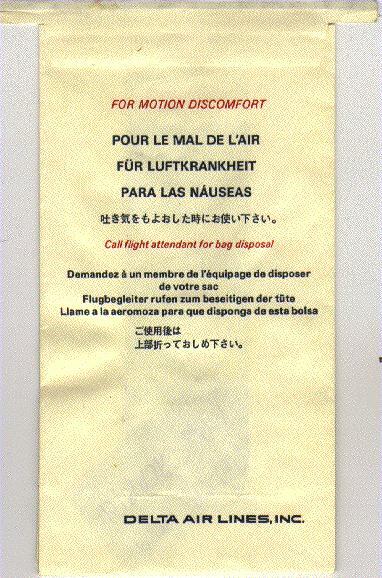 In response, Delta added the word "Bitte" (please) so that passengers felt respected when throwing up. 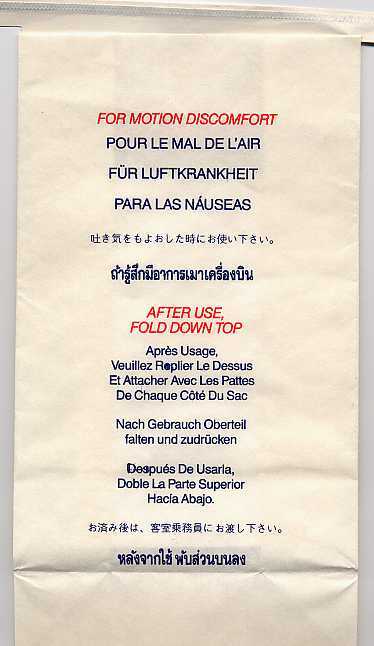 Moved English first, but kept the bag design reasonably similar. Added German. This bag slightly differs from its predecessor. 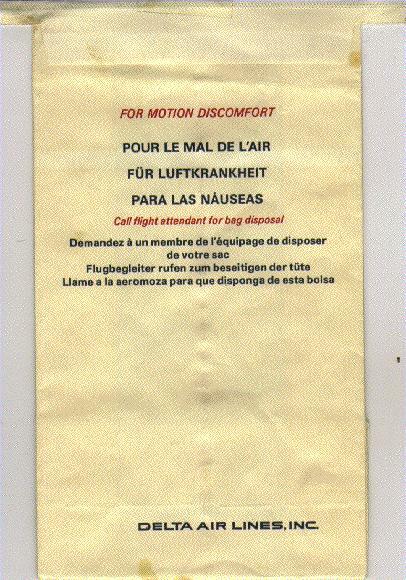 Apparently, some Germans felt that the bag's instructions weren't courteous enough. 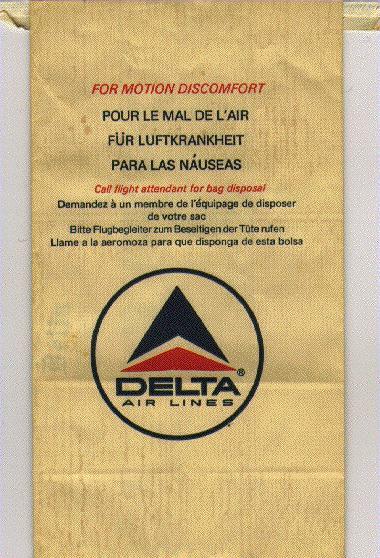 In response, Delta added the word "Bitte" (please) so that passengers felt respected when throwing up. 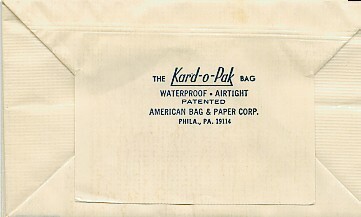 Note also that American Packaging changed its name to American Bag & Paper Corp.